Hey gang, I need your help. Mim-may fell last night and has a little fracture in her hip. Now Mim-may is a Geezer bean, so this is a big deal. She will be having surgery later today, and the hoo-man v-e-t-s will put a couple of screws in her bones to hold them together. She'll be in the hoo-man stabby place for about a week, and if all goes well she'll be home in a week. If you could send a purr-ayer her way, I'd be most grateful. Mim-may called Mom and asked if she wanted to go shopping at Macy's. Mom said she didn't need anything, but she'd go anyway. When Mom came back she had one white blouse, two bracelets, five tops, and six pairs of underwear. Have I told you lately how glad I am a cat? It's sunny and warm. Did you think I'd be anywhere else? Ah yes, it's Friday, and Mom's stay-cation starts soon. Life is good. I love having great places to nap, like this wing chair in Mom's sewing studio. It's always nice and warm. It's also a great place for a baff. Yes, I know it's "bath" but "baff" sounds funner. When Mom gets into her sewing studio early it means she forgets to post to my blog. So pals, it isn't because I'M ignoring you, it's because MOM's off in her own world. She doesn't forget to feed me, so it's all good. The Big Tennis is coming up next week, and that means Mom will be home for two whole weeks while we watch it. Her pal Roger Federer beat the Joker yesterday in Cinci so she was jumping up and down a lot. Here's one of our new daylilies in the front garden. Mom's Shade Garden is coming along quite nicely. She is happy with it. Me, I'm still enjoying the front porch. There are lots of wild baby turkeys in our neighborhood. Mom has seen them several times. and their Moms cross the street. They all got across safely. Mom and Mim-may went to the Peabody Essex Museum over the weekend and saw this sculpture. I dunno if it's a cat or a lion or a dog, or what, but he sure looks freaked out. Mom is getting used to her new iPad. She took this picture with it and is posting on blogger with it today. I'm not sure she's in love with it yet but it took this picture of me. I'm pretty sure she'll get over it. Me? I don't care as long as I get my scritches. We are supposed to have crack-and-boom storms today. I know we need the rain, but I do not like crack-and-boom storms. This is one of the daylilies that Mom planted on Sunday. Around here all the daylilies are orange, so Mom didn't want any orange ones. She wanted hers to be different, so she got some yellow ones. And she got this red one. She bought a purple one too, but that isn't open. Mom was furry busy this past weekend. She sanded and painted the front steps, as you can see in this picture. Naturally, I snoopervised from a safe and protected spot. Then she bought MORE PLANTS for the front yard. On Sunday morning, Mom planted them. Then she went into the kitchen and cooked a chick-hen and potatoes and onions and yukky broccoli. Then she made some cookies. Then she packed a quilt to go to a show in Chattanooga. Me, I stayed on the porch. 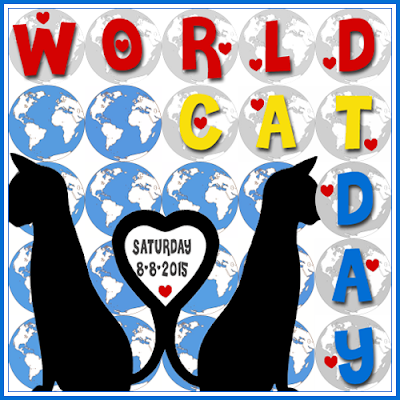 Hey, we run the internet, why shouldn't we have our own day? Happy World Cat Day! 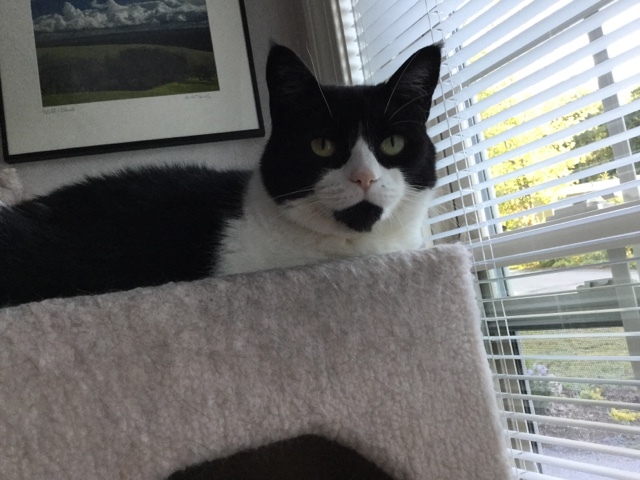 I am thankful for all the furriends who have helped me over the years and visit my blog each day. Thank you all for your comments yesterday. I am truly a lucky Cat. Wow! Time flies when you're having fun. 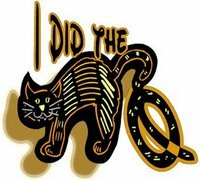 Today is my 9th Gotcha-versary. Happy Me! I got a Mom, a house, a front porch, two kitty condos, all the stinky goodness, crunchies and 'Nip I could ever ask for, a water fountain, furriends all over the world, and most of all, a safe Home. What more could a Cat want? If you're reading this today, thank you. If you contributed to my bionic leg, thank you. If you are Malcolm in Maine, or Max in California, thank you. The front porch is nice, but sometimes it gets too hot. The kitty condos are nice too, but sometimes I just want a change, so I hide out on the shelf near Mom's sewing machine. It is a nice spot, usually shady during the day, and I get to lie on a custom quilt made by my friend, Miss Julie. Bast! That hotel bed was comfy! I slept great. When the ladies got dressed, we all went down for breakfast on the terrace. and more show quilts (these were from Egypt). I found my namesake, a longarm sewing machine named Millie. And so (to her everlasting delight), did Mom! Then it was time to hit the road. After driving a couple of hours, we stopped for ice cream. Holy BAST it was a long drive home. I am SO GLAD to be home and out of those traveling duds you have NO IDEA!! So yesterday Mom packed the car, and fixed me a special seat. We picked up Mim-may and got in the car and drove. We drove through Ver-mont. I have never been to Ver-mont. Ver-mont is pretty. Then we drove to Noo York. I got a big welcome in Noo York. After another couple of hours driving (Noo York is a big state), we got to the hotel. We brought our stuff to our room. Whoa. Lookit this nice big bed. 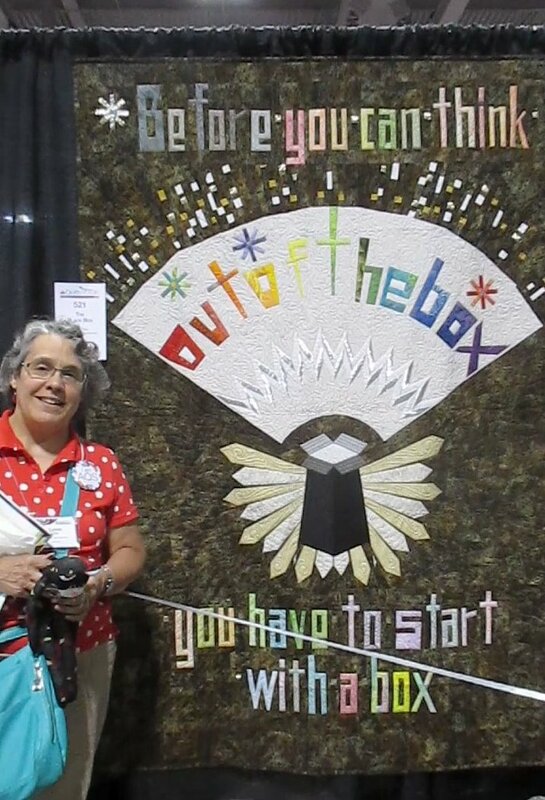 Then we went to the Oncenter, where the big quilt show was being held. I do not know why I am wearing a button that says "I am AQS" when my name is Millie. The first thing we had to do was find Mom's quilt. Found it! Then we had to find Julie's quilt. Found that too! Then we had to buy show pins for Mom, Julie and Chris. We got to the show late, and Mim-may was tired, so we went back to the hotel to rest before dinner. Mom ordered a French Martini to drink with dinner. It was quite nice (hic). Then it was back to the hotel room for an early night, because we have a very big day on Saturday, and we all needed our rest. More later! I am having fun in Sirra-cuze Noo York.